Arsenal were not quite at their clinical best but still proved too strong for Birmingham at the Emirates. Robin van Persie opened the scoring with a precise, low drive across goal after Alex Song had played him in. Abou Diaby doubled the lead when he smashed in a rising shot before Lee Bowyer volleyed in after Vito Mannone's mistake to halve Birmingham's deficit. Substitute Andrey Arshavin shot wide and Robin van Persie hit the bar before Arshavin curled in to seal the points. Arshavin's strike came at a time when Birmingham were threatening to get an equaliser but overall, the Gunners were good value for the three points that moves them up to fourth in the Premier League table. The only blemish on the Gunners' afternoon was an injury suffered by Theo Walcott, who had started a match for the first time this season but was forced off on the half-hour mark after failing to shake off the after-effects of a robust challenge by Liam Ridgewell. England winger Walcott had been one of three changes for Arsenal, with Kieran Gibbs playing at left-back and Mannone keeping his place in goal despite Manuel Almunia's return to fitness. Walcott had started brightly and tested Blues keeper Joe Hart with a curling shot that came at the end of a strong run before he was replaced by Arshavin. Arsenal had already posted warnings of their attacking intent by then, with Tomas Rosicky twice getting in good positions only to fail to connect properly with volleys. It must have made uncomfortable viewing for new Birmingham owner Carson Yeung as he sat in the stands as president of the club for the first time since he completed his takeover. Yeung has promised to make £40m available for new players but any green shoots of recovery that may come from that potential cash injection look a long way off on this showing. Fielding a team with four changes from that side that lost to Burnley, the visitors, who had lost four of their last five league games going into the match, struggled to keep pace with their opponents. 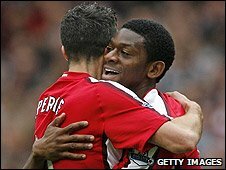 And they were soon undone by Song's fine through ball and Van Persie's equally well-placed finish gave Arsenal the lead. Moments later, Arsenal worked a great opening with some fluid football, and Diaby arrived at the far post to hammer home Rosicky's cross. Birmingham's first effort at goal came form Sebastian Larsson, but his free-kick was pushed away by Mannone. However, the Italian keeper was soon to make a costly mistake when he flapped at a cross and succeeded only in patting the ball down at the feet of Bowyer, who dispatched the ball into an empty net. Arsenal almost restored their two-goal lead when Arshavin took a snap shot but Joe Hart made a decent low stop to his right. Birmingham started the second half well and Cameron Jerome's ball almost reached Lee Bowyer via Barry Ferguson as Arsenal looked vulnerable. But the hosts hit back and Arshavin dragged a shot wide when he looked set to score before Cesc Fabregas was just about kept out by Hart. As Arsenal began to assume full control once more, they were presented with an indirect free-kick in the area after Larsson was harshly judged to have played a deliberate back pass. From the set-piece, Van Persie smashed the ball against the top of the bar. Arsenal then suffered a scare when Ridgewell's cross looked certain to be turned in before Mannone made up for his earlier error by clawing the ball away from two waiting Blues players. But the home side's nerves were settled when Arshavin cut in from the right and curled a sweet shot into the far corner. Arsenal might have had a fourth goal but Hart made a fine save to deny Diaby from close range and Van Persie's shot was blocked by Ridgewell. "We had plenty of opportunities today, perhaps it became a little bit too easy at 2-0. "We needed to regain our composure when they came back to 2-1. In the Premier League you need to keep your focus for 90 minutes. "We finally got our third goal and I believe it was a fair result. I still believe we need to improve at the back, but we are very consistent and we look strong." 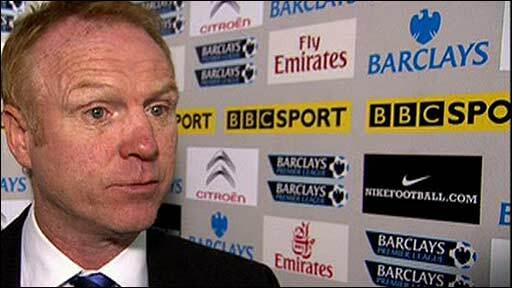 "I was much more pleased with the spirit the team showed, if not the goals they conceded. "We fought back well and got a good goal quite quickly. I think Arsenal got a bit edgy and we tried to keep them quiet after that - and that was the case. 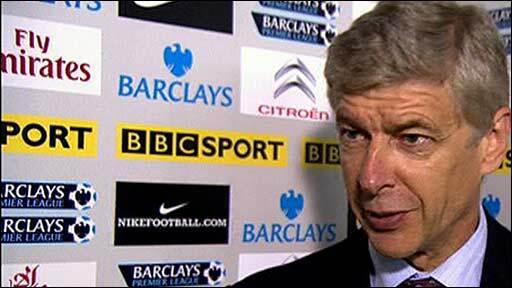 "Arsenal hit us on the counter-attack with deadly conviction but I think their third goal was harsh on us." 90:00+4:29 The match has reached full-time. 90:00+4:05 The ball is swung over by Sebastian Larsson, Vito Mannone makes a save. Correction - 90:00+2:47 Roger Johnson gives away a free kick for an unfair challenge on Vassiriki Diaby. Direct free kick taken by Vassiriki Diaby. Short corner taken by Francesc Fabregas. 90:00+2:47 Foul by Roger Johnson on Vassiriki Diaby, free kick awarded. Vassiriki Diaby takes the free kick. Corner taken short by Francesc Fabregas. 90:00+2:37 Robin van Persie takes a shot. Save by Joe Hart. 90:00+1:13 Corner taken left-footed by Gary McSheffrey from the right by-line to the near post, Header from close range by Garry O'Connor clears the bar. 90:00+0:56 Unfair challenge on Gary McSheffrey by Kieran Gibbs results in a free kick. Direct free kick taken by Stephen Carr. 89:17 Substitution Jack Wilshere on for Emmanuel Eboue. 89:17 Emmanuel Eboue crosses the ball, Vassiriki Diaby takes a shot. Save by Joe Hart. 86:26 Free kick awarded for a foul by Thomas Vermaelen on Kevin Phillips. Stephen Carr takes the direct free kick. 83:59 Assist on the goal came from Francesc Fabregas. 83:59 GOAL - Andrey Arshavin:Arsenal 3 - 1 Birmingham Goal scored by Andrey Arshavin from just inside the penalty area to the bottom right corner of the goal. Arsenal 3-1 Birmingham. 82:59 Corner taken by Gary McSheffrey from the left by-line, clearance made by Kieran Gibbs. 81:43 Unfair challenge on Vassiriki Diaby by Garry O'Connor results in a free kick. Free kick taken by Thomas Vermaelen. 80:39 Foul by Lee Bowyer on Robin van Persie, free kick awarded. The free kick is delivered left-footed by Robin van Persie from right channel. The official flags Vassiriki Diaby offside. Joe Hart takes the indirect free kick. 79:15 Liam Ridgewell delivers the ball, save by Vito Mannone. 76:56 Substitution (Birmingham) makes a substitution, with Kevin Phillips coming on for Lee Carsley. 76:56 Liam Ridgewell gives away a free kick for an unfair challenge on Francesc Fabregas. The free kick is swung in left-footed by Robin van Persie. 73:58 Robin van Persie takes the inswinging corner, Thomas Vermaelen takes a shot. Save by Joe Hart. 72:31 Roger Johnson takes the direct free kick. 72:31 Booking Alexandre Song Billong is shown a yellow card for unsporting behaviour. 72:26 Alexandre Song Billong concedes a free kick for a foul on Gary McSheffrey. 71:19 Substitution Bacary Sagna on for Tomas Rosicky. 70:41 Free kick awarded for a foul by Gary McSheffrey on Vassiriki Diaby. Kieran Gibbs restarts play with the free kick. 69:52 Substitution Gary McSheffrey joins the action as a substitute, replacing James McFadden. 69:52 A cross is delivered by Andrey Arshavin. 69:11 Emmanuel Eboue produces a cross, comfortable save by Joe Hart. 68:32 Andrey Arshavin crosses the ball, save by Joe Hart. 64:52 Effort on goal by Robin van Persie from inside the penalty box misses to the right of the target. 64:03 Free kick awarded for a foul by Robin van Persie on Roger Johnson. Free kick taken by Roger Johnson. 63:20 Vassiriki Diaby takes a shot from deep inside the box clearing the bar. 62:29 Booking Caution for Liam Ridgewell. 62:02 Lee Carsley challenges Francesc Fabregas unfairly and gives away a free kick. Francesc Fabregas takes the direct free kick. 60:36 Substitution Garry O'Connor comes on in place of Cameron Jerome. 59:57 Roger Johnson fouled by Robin van Persie, the ref awards a free kick. Free kick taken by Joe Hart. Correction - 57:48 Indirect free kick taken by Francesc Fabregas, Robin van Persie takes a shot. Correction - 57:48 Booking Booking for Joe Hart for not retreating ten yards at a set play. 57:48 Free kick taken by Francesc Fabregas, Robin van Persie takes a shot. 57:48 Booking Caution for Joe Hart. 54:48 Francesc Fabregas has an effort at goal from outside the penalty box missing to the wide right of the target. 53:50 Francesc Fabregas decides to take the corner short. Tomas Rosicky takes a shot. Blocked by James McFadden. 51:57 Close range shot by Andrey Arshavin goes wide of the right-hand upright. 51:17 The referee blows for offside. Emmanuel Eboue restarts play with the free kick. 50:29 Stephen Carr fouled by Tomas Rosicky, the ref awards a free kick. Direct free kick taken by Stephen Carr. 49:40 Francesc Fabregas produces a right-footed shot from just outside the penalty box that goes wide left of the target. 48:25 The ball is crossed by Sebastian Larsson. 45:50 Andrey Arshavin sends in a cross, comfortable save by Joe Hart. 45:00+3:16 The match has reached half-time. 45:00+1:43 Kieran Gibbs sends in a cross, save by Joe Hart. 42:04 Corner taken by Robin van Persie from the right by-line to the near post, clearance by Lee Carsley. 41:12 Andrey Arshavin takes a shot from 18 yards. Save by Joe Hart. 39:13 Kieran Gibbs fouled by Sebastian Larsson, the ref awards a free kick. Francesc Fabregas crosses the ball in from the free kick, clearance by Scott Dann. 37:12 GOAL - Lee Bowyer:Arsenal 2 - 1 Birmingham Lee Bowyer fires in a goal from close in to the top right corner of the goal. Arsenal 2-1 Birmingham. 36:03 The ball is crossed by James McFadden. 34:17 Andrey Arshavin takes a inswinging corner from the left by-line to the near post, Lee Carsley makes a clearance. 33:32 Free kick awarded for an unfair challenge on Andrey Arshavin by Lee Bowyer. Francesc Fabregas restarts play with the free kick. 32:09 Substitution Andrey Arshavin is brought on as a substitute for Theo Walcott. 31:42 Foul by James McFadden on Emmanuel Eboue, free kick awarded. Free kick taken by Emmanuel Eboue. 31:06 The assistant referee signals for offside against Cameron Jerome. Free kick taken by Alexandre Song Billong. 29:20 Free kick awarded for an unfair challenge on James McFadden by Francesc Fabregas. Lee Carsley takes the free kick. 28:57 Theo Walcott has an effort at goal. Lee Bowyer gets a block in. 27:24 Foul by Alexandre Song Billong on James McFadden, free kick awarded. Strike on goal comes in from Sebastian Larsson from the free kick, save made by Vito Mannone. 26:56 Stephen Carr gives away a free kick for an unfair challenge on Tomas Rosicky. Alexandre Song Billong restarts play with the free kick. 26:41 Shot by Robin van Persie. Stephen Carr gets a block in. 26:14 Free kick awarded for an unfair challenge on Thomas Vermaelen by Cameron Jerome. Free kick taken by Vito Mannone. 25:25 Vassiriki Diaby takes a shot. Comfortable save by Joe Hart. 20:29 The offside flag is raised against Theo Walcott. Joe Hart takes the free kick. 18:50 Sebastian Larsson takes a outswinging corner from the right by-line played to the near post. 17:18 Assist by Tomas Rosicky. 17:18 GOAL - Vassiriki Diaby:Arsenal 2 - 0 Birmingham A brilliant goal is scored by Vassiriki Diaby from inside the box to the top right corner of the goal. Arsenal 2-0 Birmingham. 15:27 Assist on the goal came from Alexandre Song Billong. 15:27 GOAL - Robin van Persie:Arsenal 1 - 0 Birmingham Robin van Persie fires in a fantastic goal from inside the box to the bottom right corner of the goal. Arsenal 1-0 Birmingham. 14:25 The ball is delivered by Emmanuel Eboue. 13:01 Free kick awarded for a foul by James McFadden on Emmanuel Eboue. Emmanuel Eboue takes the free kick. 11:54 Free kick awarded for a foul by Lee Bowyer on Francesc Fabregas. Direct free kick taken by Thomas Vermaelen. 11:19 Tomas Rosicky has an effort at goal from outside the penalty area missing to the wide left of the goal. Correction - 10:28 The ball is delivered by Theo Walcott, save made by Joe Hart. Inswinging corner taken right-footed by Francesc Fabregas from the left by-line to the near post, Lee Carsley manages to make a clearance. 10:28 The ball is crossed by Theo Walcott, save made by Joe Hart. Inswinging corner taken by Francesc Fabregas from the left by-line, clearance made by Lee Carsley. Correction - 8:57 Shot from 12 yards from Tomas Rosicky. Blocked by James McFadden. 8:57 Tomas Rosicky has an effort at goal from 12 yards. Blocked by James McFadden. 5:34 Robin van Persie takes the inswinging corner, Lee Carsley manages to make a clearance. 4:07 Tomas Rosicky has an effort at goal from the edge of the area that misses to the right of the target. 3:00 Free kick awarded for an unfair challenge on William Gallas by James McFadden. Free kick crossed left-footed by Robin van Persie from right wing, Joe Hart makes a save. 0:47 Free kick awarded for a foul by Sebastian Larsson on Francesc Fabregas. Alexandre Song Billong restarts play with the free kick. 0:29 Free kick awarded for a foul by Lee Bowyer on Francesc Fabregas. Free kick taken by Francesc Fabregas.